"Compassionate Classrooms" is one of the very successful projects run by STRAW India that has been awarded the Impact Grants Award 2013 by The Pollination Project, USA. Through this project, STRAW India has been able to introduce Humane Education contents relating to empathy for people, compassion for animals and respect for environment into the school textbooks that are published and re-published from time to time by Educational Boards like the Central Board of Secondary Education (CBSE) and other state level educational boards. 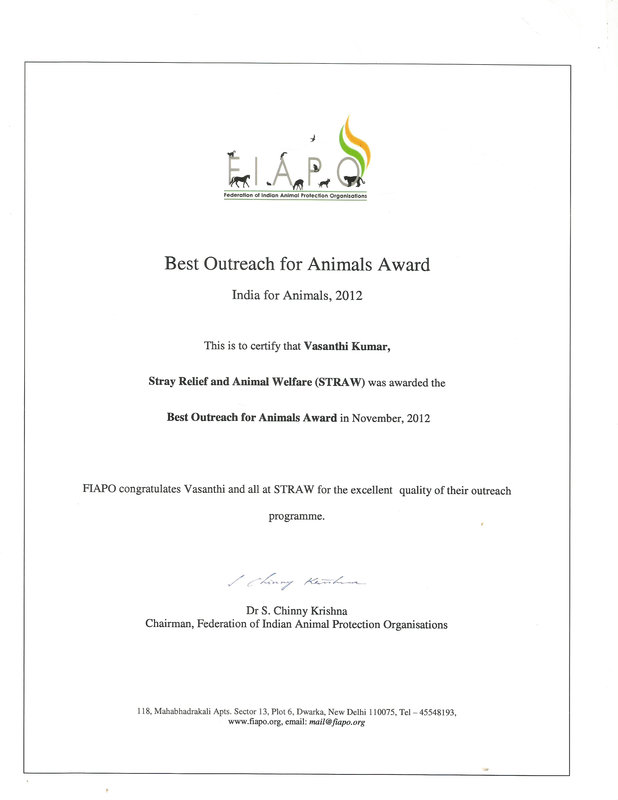 IFA Outreach for Animals Award was given by the Federation of Indian Animal Protection Organizations (FIAPO) to those, whose outreach work has been helping and supporting the cause of animals, among the largest number of people in the community. 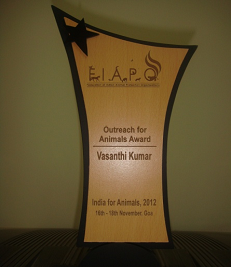 Our founder, Vasanthi Kumar was given this "Best Outreach for Animals Award" during the India for Animals conference held at Goa, India in November 2012. In fact, she shared this award with one of the world's largest animal welfare organizations, World Society for the Protection of Animals (now known as World Animal Protection). This award was conferred for her contribution of about 200 pages of contents relating to compassion towards animals, empathy for people and care of the environment. This content into the school textbooks for standards/classes VI, VII & VIII was published by the Central Board of Secondary Education (CBSE). Since more than 10,000 schools in India and abroad are affiliated to the CBSE, over 5 million students, year after year would be exposed to these contents. 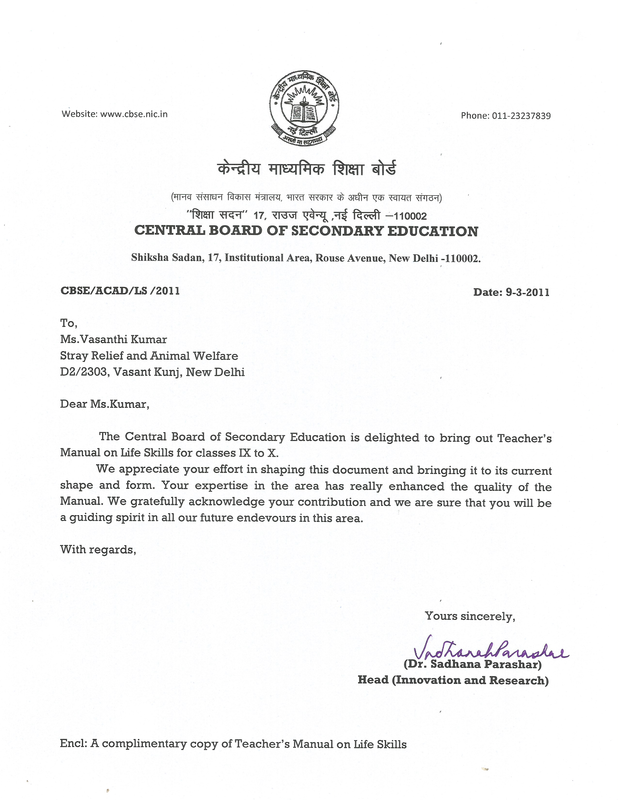 STRAW's content and other contributions to Central Board of Secondary Education (CBSE) Teachers Manual on Life Skills was greatly appreciated and acknowledged with an appreciation letter. 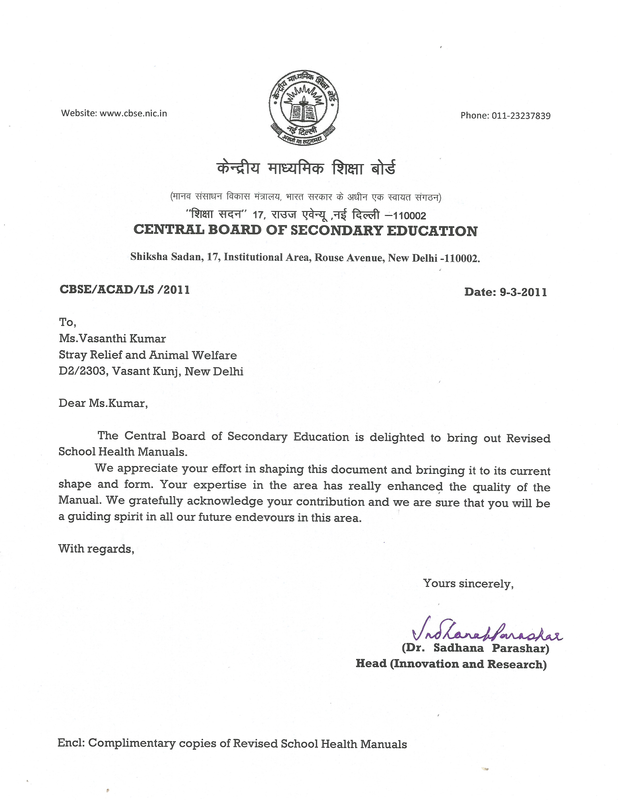 STRAW's content and other contributions to Central Board of Secondary Education (CBSE) Revised School Health Manuals that led to its major enhancement was greatly appreciated and acknowledged with an appreciation letter. 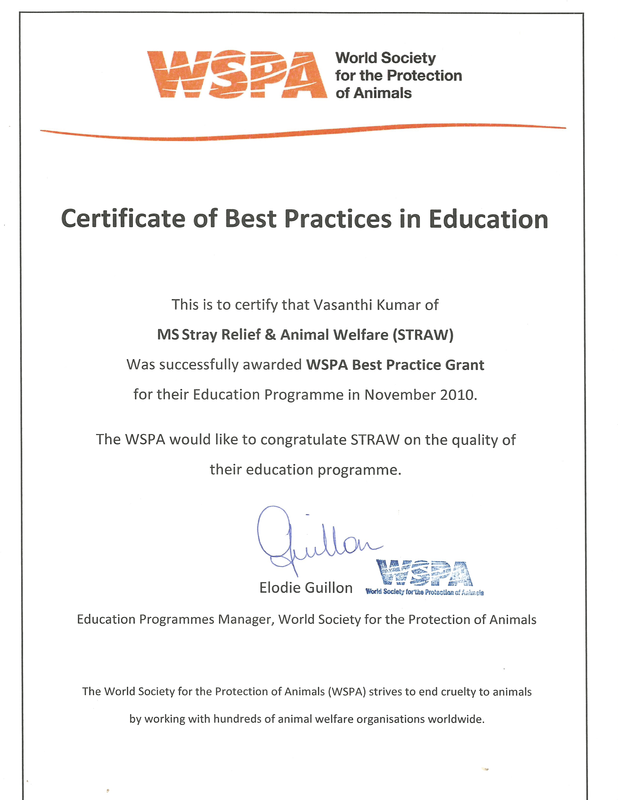 STRAW conducted series of humane education programs, for which World Animal Protection (formerly known as World Society for the Protection of Animals (WSPA)) awarded Certificate for Best Practices in Education. 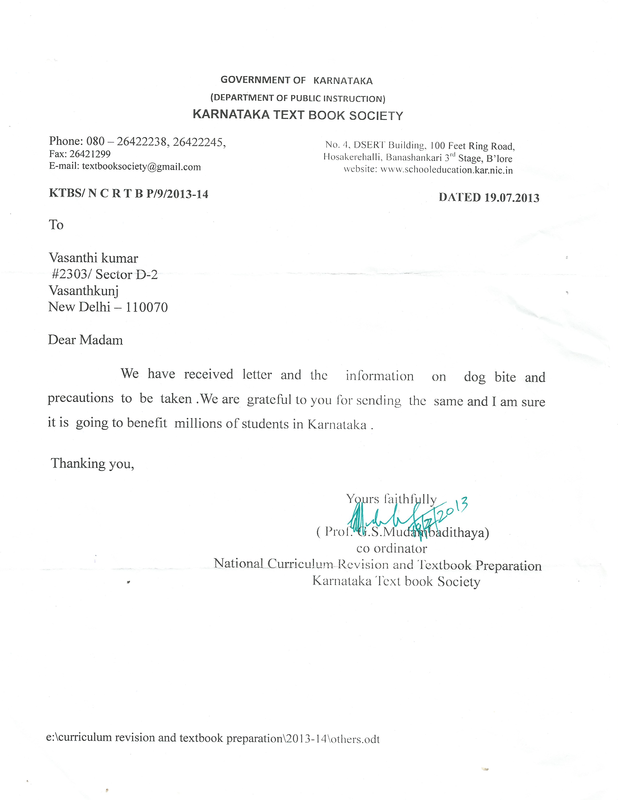 STRAW's content contributions to Karnataka Text Book Society's publications to be distributed among millions of students in Karnataka state of India, was appreciated and acknowledged with an appreciation letter.